Full disclosure, I work on the same team as Dominic Mendiola in my day job. That being said, if I didn’t like his salsa I wouldn’t be writing about it. The relationship was mentioned in the article, but I wanted to ensure it was explicitly stated. 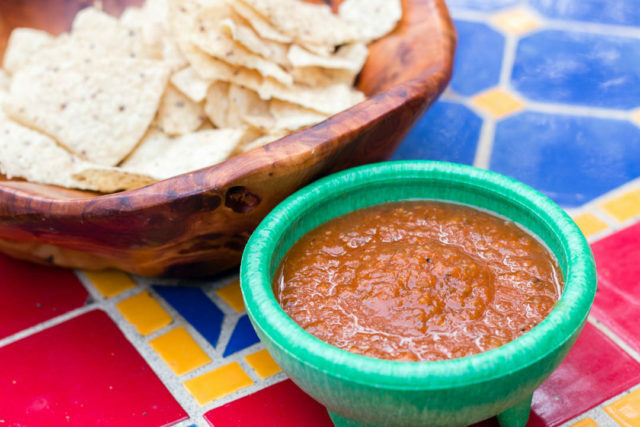 In South Texas, salsa is one of the five food groups. We eat it for breakfast, lunch and dinner here in San Antonio. At home I mix together peppers, cilantro and tomatoes from my garden for a quick fresh salsa, and I love that salsa is the precursor to most meals when eating out. 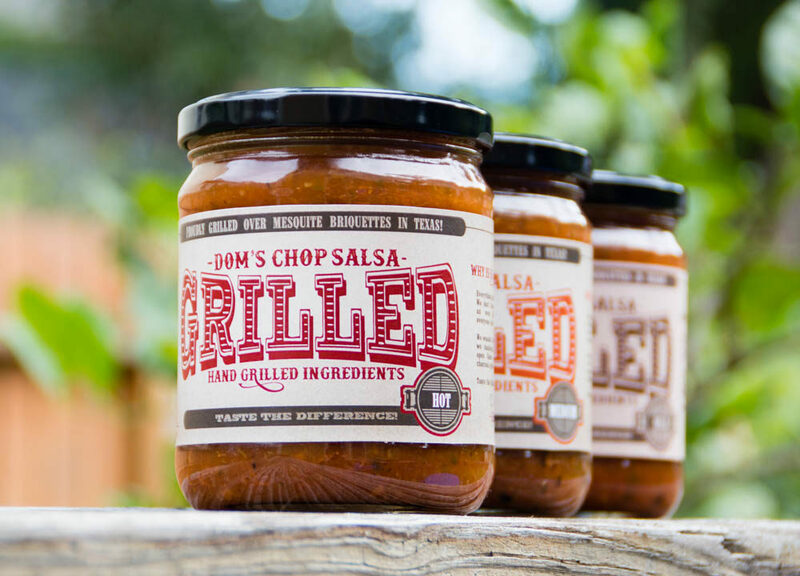 So I was a little skeptical when I first learned of this Dom’s Chop Salsa (DCS) made by my coworker Dominic Mendiola—I mean, you want me to pay for salsa? Adding to my doubt was that a colleague was the guy making it; were people simply raving about it because they worked with Dominic? After getting to taste some of his salsa first hand, I can see what the fuss is about. Dom’s Chop Salsa ingredients. Photo by Garrett Heath. DCS is the real deal—this ain’t your mama’s Pace Picante. The secret ingredient to DCS isn’t really an ingredient at all; it’s the fact that some of his ingredients are grilled over an open flame. This gives his salsa a bit of smokiness that comes from a person who cares enough about his consumers to deliver a top-notch product. I am a fan of the DCS Hot variety—it leaves a nice spicy aftertaste without making you too uncomfortable. 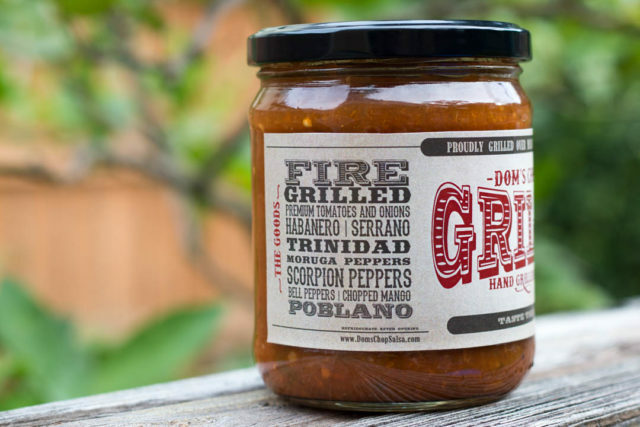 I know that Dom has incorporated flavors from the fiery scorpion pepper into his Hot version before, but he does it in a tasteful (and tasty) manner. DCS Hot isn’t out to prove that it’s the spiciest salsa on the block, but rather one that you’ll want to put on almost everything (I am a fan of it on my morning eggs). Putting the DCS Hot to the test on the patio. The Medium has a little bit of sweetness to it and doesn’t pack near amount the heat as the Hot. In my mind the Medium is an acceptable jar of salsa to take to a tailgating party—there’s a good flavor for those folks who may miss out on the bite of a hotter salsa while giving an acceptable spicy nudge to those who may not be used to hot foods. For those San Antonians weaned on spicy food from a young age, I don’t see why you would want to purchase the DCS Mild. While it indeed has that nice smoky flavor, it is absent of much heat. The only reason that I think that DCS was created was so that Dom can achieve his goal of nationwide salsa dominance and that he needs something mild enough for the Yankees to eat. Hopefully DCS Mild will serve as a “gateway salsa” for these folks without enough spice in their life. 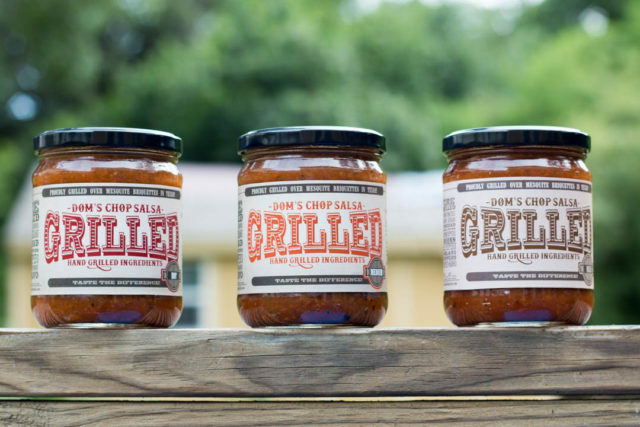 The lineup of Dom’s Chop Salsa: Hot, Medium and Mild. Photo by Garrett Heath. So you’re probably wondering where you can get a jar of DCS—currently it is not in mass production, but you can help speed the process along. Dominic needs to build a custom made grill so that he can roast those veggies on an open flame in mass quantities. Check out his Indiegogo campaign for more information—you’ll be able to back it through July 20th. Until then, I’m just going to have to nurse these three bottles that I have at the house.